In light of the death of Nelson Mandela yesterday, I thought it might be appropriate to talk about the cookbook, “Ukutya Kwasekhaya” (home food),”Tastes from Nelson Mandela’s Kitchen”, written by Mr. Mandela’s personal chef for many years, Xoliswa Ndoyiya. Ms. Ndoyiya not only cooked for the Mandela family, but cared for his grandchildren as well and became a beloved member of their family. Ms. Ndoyiya began working for the Mandelas shortly after Mr. Mandela was released from prison in February, 1990. The recipes are the favourites of members of the Mandela family and the author notes that, “Although he’s the most famous man in the world, Madiba’s tastes are simple and he is happiest with traditional South African food”. Nelson Mandela was born Nelson Rolihlahla Mandela, although throughout her book, Ms. Ndoyiya refers to him as “Madiba”, which was his clan name and also a nickname for him. 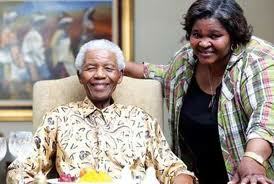 Nelson Mandela with the family’s chef and author of “Ukutya Kwasekhaya”, Xoliswa Ndoyiya. Recipes in the cookbook are diverse: Potato Bread, Isophu (sugar bean and white maize soup), Peri-Peri Chicken, Late-Start Starter fish, Peanut Butter and Spinach Soup, Umxhaxha (corn and pumpkin), Citrus Pudding, and many more intriguing dishes. The cookbook is well worth having on one’s cookbook shelf and the Nelson Mandela Foundation facilitated its publication in 2011. This entry was posted in Cookbooks, Cooking, Cooking and Social History, Eating, Uncategorized and tagged cookbooks, Cooking, Madiba, Nelson Mandela, Nelson Mandela International Day, social history, South Africa, South African Cooking, Sue Jimenez, Tastes from Nelson Mandela's Kitchen, Ukutya Kwasekhaya, Xoliswa Ndoyiya. Bookmark the permalink.